The hustle and bustle of the holiday season can be both frantic and magical. Between baking countless batches of cookies, shopping to find the perfect gift for friends and family members, and decorating your home, there are many memorable moments to be had and shared with loved ones. Gift wrapping doesn’t usually fall under the “memorable moments” category, though. When it comes time to wrap all of your pretty parcels, you may feel overwhelmed with the clutter of your gift wrapping supplies. But don’t get caught up in the notion that wrapping presents has to be a chore! While finding the time and space to gift wrap presents for the holidays can be a challenge, it doesn’t have to be this way. With a few adjustments and organizational tools, you can set up a space for your very own gift wrapping station to keep you organized and on task. If you’re anything like me, you tend to keep all of your gift wrapping supplies randomly stashed all over the house. Rolls of wrapping paper in the corner of the closet or jumbled in a Rubbermaid tub, gift bags tucked behind a shelf, and tissue paper in a drawer. While these storage options are fine for occasional use, it’s not ideal, especially when you start running around trying to gather all of the supplies when it’s time to wrap! 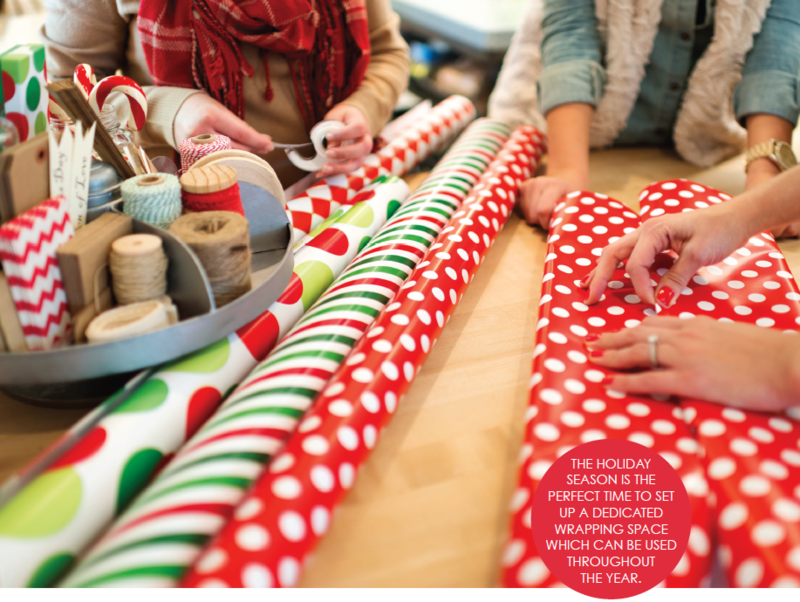 The Christmas season is the perfect time to set up a dedicated gift wrapping space. 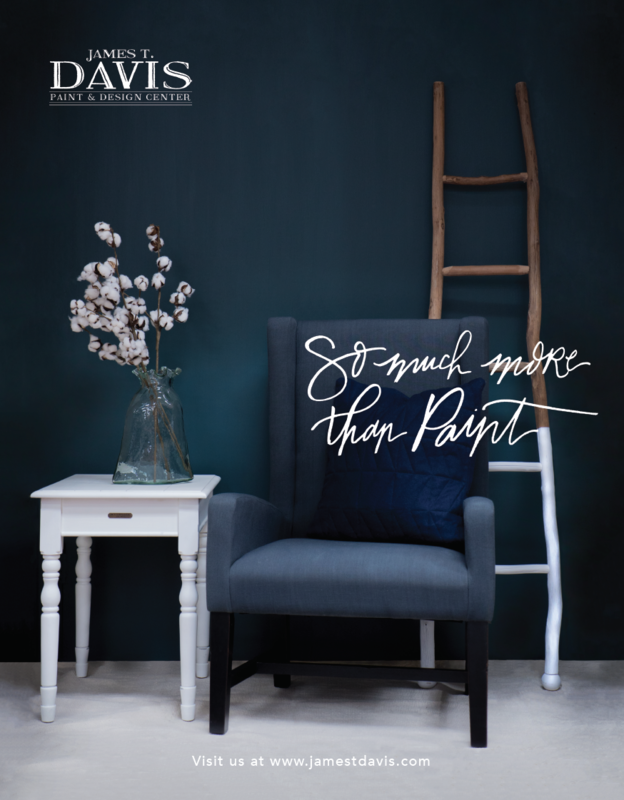 You can use this space for gift wrapping throughout the year: Birthdays, weddings, and baby showers, for example, are just a few occasions when a creative nook for gift wrapping comes in handy. A gift wrapping station can be set up anywhere in your home, but there are a few things you will want to keep in mind when searching for the right spot. While a dedicated room might not be possible, with a little creativity and organization, an existing space can work well. A laundry room can make a great space for all of your gift wrapping needs. If you’ve got extra shelving space or a closet, you can store your supplies there for quick and easy access. A folding station for clothes or a counter top can serve as a place to spread out your gifts and wrapping paper. An office or guest bedroom is also a great place to store all of your holiday packaging. If using an office, your desk probably already has some of the supplies you need such as scissors and tape. Store extra supplies such as tags, ribbon, and bows in a desk drawer, boxes, or baskets and use the top of the desk for your wrapping station. If you’re tight on space, try turning a coat closet into a gift wrap organizer. An over-the-door wire organizer can hold wrapping supplies, and if you don’t have a flat surface nearby where you can wrap your gifts, you might want to buy a folding card table that you can keep tucked in the closet. 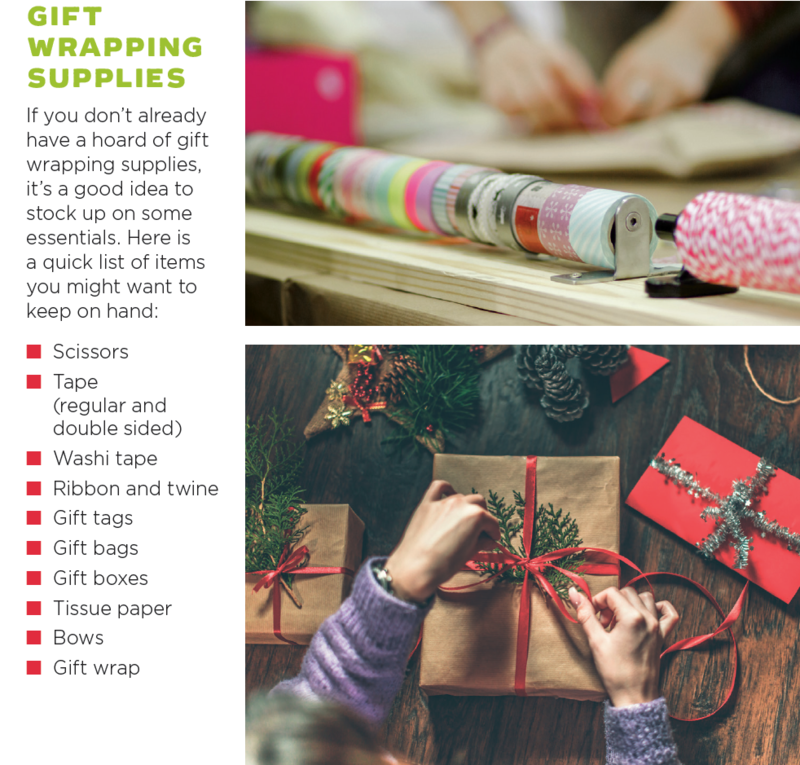 Whether you’re setting up shop in a guest bedroom, office, or a closet, keeping your gift wrapping supplies in order is a must! Before heading out to your local craft or office supply store, take a look around your house to see what organizational tools you may have on hand. Baskets are handy for holding some of your bulkier gift wrapping items such as gift boxes. Place them in a guest or laundry room closet and add a few inexpensive wall-mount magazine holders to help keep bows and tissue papers organized and wrinkle free. Gift tags and Washi tape (a decorative tape with a myriad of prints and patterns) can be stored in cute tin buckets or mason jars and placed on shelves in closets, on desk tops, or in a craft cart. Stackable boxes are also useful space savers and help keep things organized. A free-standing cart is a great way to keep all of your gift wrapping supplies handy and accessible in one place. Most carts have several levels to them, so you can easily store all of your bows, tags, ribbons, tape, scissors, and tissue paper. And when you’re not using the cart, simply roll it away into a corner or a closet. Mount a mail organizer to the wall of your gift wrapping space to store gift bags, tissue paper, and more. Peg boards are also a great way to keep all of your supplies neatly organized and displayed in one place. If you are setting up your gift wrapping station in a closet, you can use dowel rods mounted with cup hooks to the sides of the wall, or inside a shelf, to neatly hold rolls of paper. If you need to spread out the paper, simply take the roll off the hooks and replace it when you are done. Storing your gift wrap this way not only looks nicer than keeping it in the back of the closet, it also keeps the wrap from getting crumpled and ripped along the edges. The holidays are meant to be enjoyed with friends and family, so let’s not get caught up in the stress and frenzy that can so easily surround us. Instead, start the season off right with a neatly-organized space dedicated to all of your creative gift wrapping ventures.